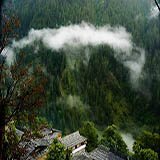 Kasauli is a cantonment and town, located in Solan district in the Indian state of Himachal Pradesh. The cantonment was established by the British Raj in 1842 as a Colonial hill station,77 kilometres (48 mi) from Shimla, 65 kilometres (40 mi) from Chandigarh, and 50 kilometres (31 mi) from Panchkula, and lies at a height of 1,800 metres (5,900 ft). Christ's Church is situated on the busiest street of the town, the Mall Road. Constructed during the British era in Gothic style architecture, the grand church is amongst famous tourist attractions of the town. 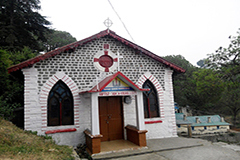 It is one of the prominent churches of the hill station, other being the Chapel of Lawrence School (Sanawar), Baptist Church and the St. Patrick's, Irish Roman Catholic Church adjoining St. Maryâ€™s School. 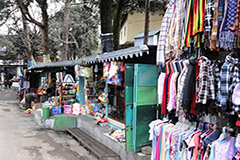 Dagshai, nestled in the Shivalik foothills, is among the oldest British cantonments in the country. 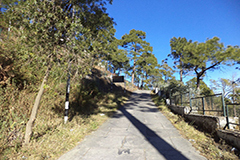 The cantonment area is located at an altitude of 6000 ft above the sea level. At the top of Dagshai hill, colourful red and green rooftops school campuses exist, which dates back to 1876. The village located on the hill-peak also feature a soccer field, where Durand Cup was hosted. 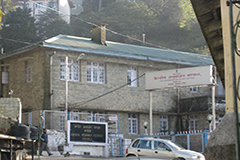 Central Research Institute (CRI) was established during colonial rule of British, in the year 1905. The beautiful campus of the institute attracts several tourists throughout the year. Engaged in diligent research and development activities, the institution has formulated vaccines for treatment of several diseases like smallpox, typhoid, cholera and snakebite. 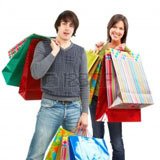 The Mall or The Mall Road is the busiest region of the town that offers numerous shopping options. Visitors can engage in nature walks through the Upper Mall and Lower Mall streets. Walkerâ€™s Paradise is the main centre of the destination's social life. The Baptist Church showcases the beautiful blend of Gothic and Indian style of architecture. 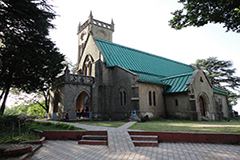 Built in the year 1923 by British, the church is among the most visited structures in town. Sunset Point renders beautiful view of the horizon, changing its colours during sundown. Visitors can enjoy fading sun rays with refractions in the atmosphere, marking end of the day. There is another famous city point along with the Sunset Point, known as Lover's Lane. Monkey Point is the highest peak of the town. Located 4 km from the bus stand, from the top tourists can get a complete view of the plains of Chandigarh region and the river Sutlej flowing through the valleys. 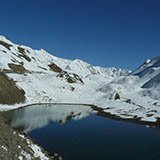 Visitors can also spot a snow covered peak of 'Choor Chandni', the highest peak of the Lower Himalayan belt. 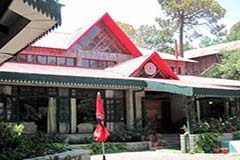 Kasauli Club, situated within the Indian Army cantonment, was established in the year 1880. One of the most prestigious social clubs in the country, its membership comes with 15 years wait time. The club is managed by the Indian Army personnel, known as 'Club Secretary'. Highlight of the club, which was built using wood of high quality, is its aesthetic wooden interiors and decoration. 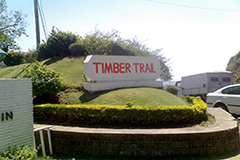 Timber Trail Resort is spread over two hills and is connected by a cable car. 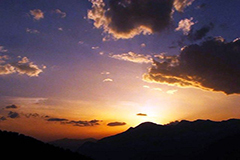 Located in Parwanoo, 40 km from Kasauli, it is among famous holiday destinations. The resort is based on a mountain top, which is surrounded by pine forests and offers complete view of the Kaushalya river meanders. 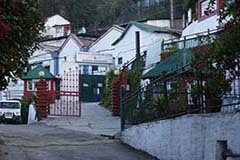 Kasauli Brewery is the world's highest distillery, located in the outskirts of Kasauli town. The distillery and brewery were established in 1820's by Edward Dyer. This location was chosen due to the fine spring water and climatic conditions, similar to Scotland. 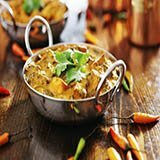 Brewing and distilling equipment of England and Scotland that included copper pot stills, which were used then, are utilised even today. 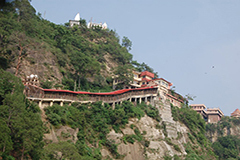 Baba Balak Nath Temple, a hill-top temple, is among the most frequented shrines of the town. 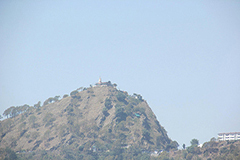 The Sidh Baba Balak Nath Temple is located on the Graner Hill. This cave temple dedicated to Baba Balak Nath, an ardent follower of Lord Shiva. 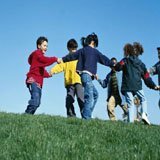 There are plenty of Kasauli tourist attractions,things to see in Kasauli, and one can choose from range of activities available or things to do in Kasauli which can be a walk in the green forests areas, adventure treks. 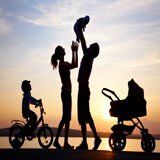 If you are searching for Kasauli attractions,sightseeing in Kasauli,best places to visit Kasauli,things to see in Kasauli,tourist places in Kasauli by list,tourism point Kasauli,tourist attractions near Kasauli, places worth visiting Kasauli, Kasauli holidays, Kasauli tourist spots, see Kasauli Himanch Pradesh, best attractions in Kasauli, tourist attractions in Kasauli, local sightseeing in Kasauli, attractions in Kasauli Himanch Pradesh,places for sightseeing in Kasauli,Kasauli peak, places of tourist interest in Kasauli,what to see in Kasauli,sightseeing around Kasauli, list of famous tourist spots in Kasauli Himanch Pradesh,Kasauli sightseeing places your search ends at allseasonsz.com for the likings of all age groups. 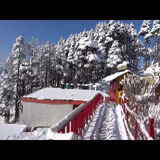 There are tourist places near by Kasauli offering majestic views of Himalayan peaks.Allseasonsz.com Himanch Pradesh best travel agents required for making your Kasauli trip memorable. 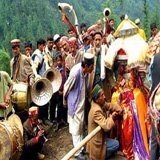 Whether it is about sightseeing around Kasauli, Kasauli excursions, Kasauli places to visit, tourist attractions around Kasauli-Allseasonsz.com Himanch Pradesh is convenant to propose amazing Kasauli Packages offers and deals for your tour.